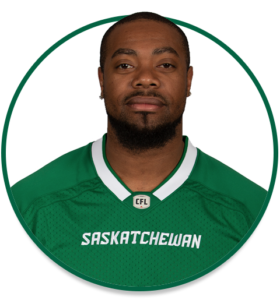 PRO: Re-signed with the Riders as a free agent in February, 2017…acquired by the Riders in May, 2016…signed with the Edmonton Eskimos in June, 2013…acquired by the Winnipeg Blue Bombers in June, 2009…signed with the Eskimos in September, 2008…signed with the New York Jets in August, 2008…signed with the Arizona Cardinals as an undrafted free agent in April, 2008. 2018: Started all 18 regular-season games and the Western Semi-Final at right tackle on the Riders’ offensive line. COLLEGE: A three-year starter at Mississippi Valley State…earned two consecutive All-Southwestern Athletic Conference honours…in his final two years, at left tackle, he registered 186 knockdowns, including 17 touchdown-resulting blocks and allowed just 2.5 sacks…during senior year, he led the conference in knockdowns with 103.